I can barely function when I’ve forgotten my phone somewhere, so chances are good that I’d probably curl up and die if I were ever stranded alone on a deserted tropical island. All the same, adventure games like Return to Mysterious Island give me this crazy sense of false hope that I could somehow survive such an ordeal through an ingenious combination of wits, random bits of vine, and turtle eggs. A port of the 2004 PC game, Return to Mysterious Island is based on the classic Jules Verne novel and hearkens back to the point-and-click adventures of the 90’s Golden Age. Like Myst, Return to Mysterious Island is a beautifully moody, first-person adventure game, packed with lots of atmosphere and fiendishly difficult puzzles. I warn you now, there’s a reason they included a link to a walkthrough in the starting menu. You play as Mina, the shipwrecked survivor of a solo round-the-world sailing trip, who is washed ashore on an unfamiliar, seemingly deserted island. She quickly realizes she is not alone and soon uncovers a host of mysteries during her island adventure. The island itself is pretty stunning. The 3-D graphics are quite lush and impressive, and the interface allows for full 360 degree views, so you can spend quite a bit of time examining every last nook and cranny. There are also brief 2-D cutscenes on occasion, which are rendered in more of a comic-book style, but still charming and appropriate to the setting. The sound fares rather less well, as the music gets rather repetitive and I feel like the game loses something by not having more environmental sound effects, like waves and wind, but it’s still a very immersive and lovely setting. As you explore the island, you’ll come across a huge variety of random objects to interact with, some of which go into your inventory. Item combination is a huge part of solving the puzzles in the game, but their system is on the extremely complicated side. In general, the puzzles are interesting and nicely intuitive, but decrypting the massive item combination system makes things very difficult at times. Often you’ll end up trying to combine everything you come across, which quickly gets tedious when you have such a massive number of objects to work through. Usually, interactive points are marked with a handy target, but occasionally there are items which are entirely hidden, which is a problem, since it’s easy to miss things and frequently be forced to revisit areas. In general, I found the game interface rather confusing, which detracted from the otherwise beautiful nature of the game, although I still enjoyed the puzzles and overall atmosphere. 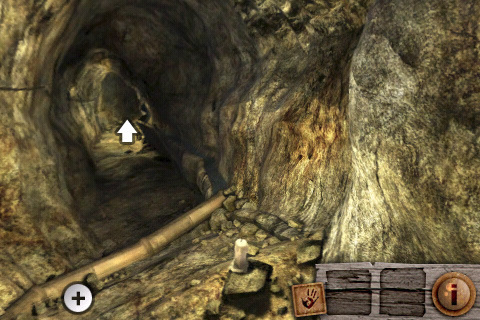 If you’re a fan of adventure games, this is a very rich addition to the genre. It doesn’t have the breezy charm of classic titles like Monkey Island and Broken Sword, but it does evoke the same gently dreamy and infuriating qualities of Myst. You’ll want to keep that walkthrough handy, but this is still a game with a lot to offer. AppSafari review of Jules Verne’s Return to Mysterious Island was written by Tracy Yonemoto on April 26th, 2010 and categorized under Adventure, App Store, Featured, Fun, Games. Page viewed 4683 times, 1 so far today. Need help on using these apps? Please read the Help Page.